SUWON, Gyeonggi Province ― “For continued growth, we must aspire to become a creative company capable of leading change. Erecting our R5 institute was one such chance for precipitating the change and advancement required for becoming a truly creative company,” said Shin Jong-kyun, Samsung Electronics mobile unit chief. His speech was on the day Samsung held a ceremony for marking the move into Samsung’s newest mobile research institute, the R5, in Suwon, home to the world’s largest consumer electronics company and chipmaker. Industry watchers said both the speech and the ceremony signaled that mobile products and services would continue to be the nerve center for Samsung, which this month celebrated the 20th anniversary of the “New Management Initiative” by chairman Lee Kun-hee. Research and development is cited as one of the most significant driving engines behind Samsung’s growth into a global electronics powerhouse. Samsung executives including vice chairman Kwon Oh-hyun and president Yoon Boo-keun attended the event, along with Suwon and Gyeonggi dignitaries such as Gyeonggi Province Gov. Kim Moon-soo. The R5, the fifth and latest research lab installment in Samsung’s Digital City in Suwon, aspires to be the heart for mobile and related research for Samsung. The newest facility will house up to 10,000 of the research and development personnel that have been spread widely across the plants at Suwon, the company said. It is formed by 27-story twin towers, and uses mostly energy-efficient LED lights, which will help reduce power consumption by up to 40 percent, Samsung officials said. 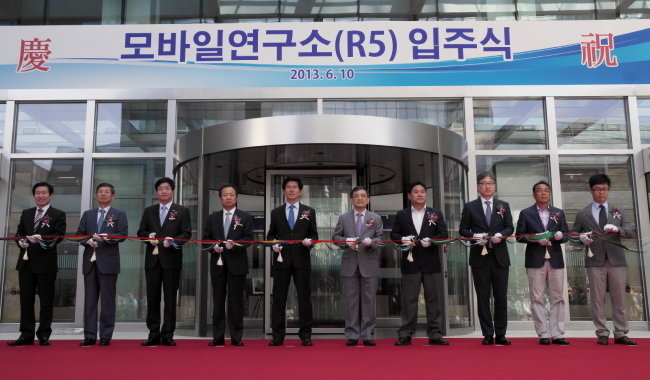 The R5 research institute follows on the heels of other research facilities built by Samsung starting as early as 1980 with just 390 staff members ― the R1. The R2 is the DMC research institute, completed in 1987. The R3 information communication lab, built in 2001, helped create a series of the world’s first mobile phones, and a next-generation wireless broadband system. The R4 digital research institute followed in 2005 to drive Samsung’s strength in the television industry.